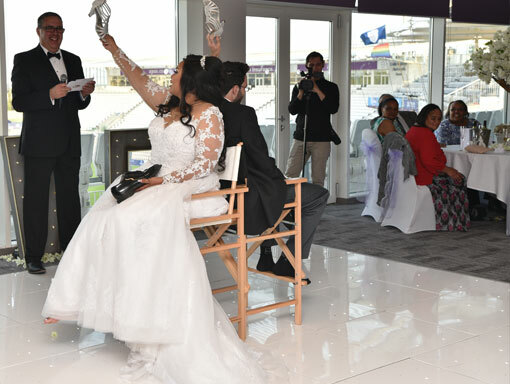 This summer, we had the pleasure of two trips to Southampton, Hampshire, to provide our signature all day wedding service at the Ageas Bowl and Hilton at The Ageas Bowl, the home of Hampshire county cricket. The cricket ground and residential hotel complex are situated in the West End, Southampton. The luxury surroundings, stunning views and unrivalled facilities, along with facilities for an intimate or large, lavish wedding, are world class. 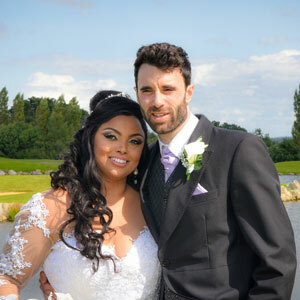 The first wedding was for Angela & Mark on the 15th July. 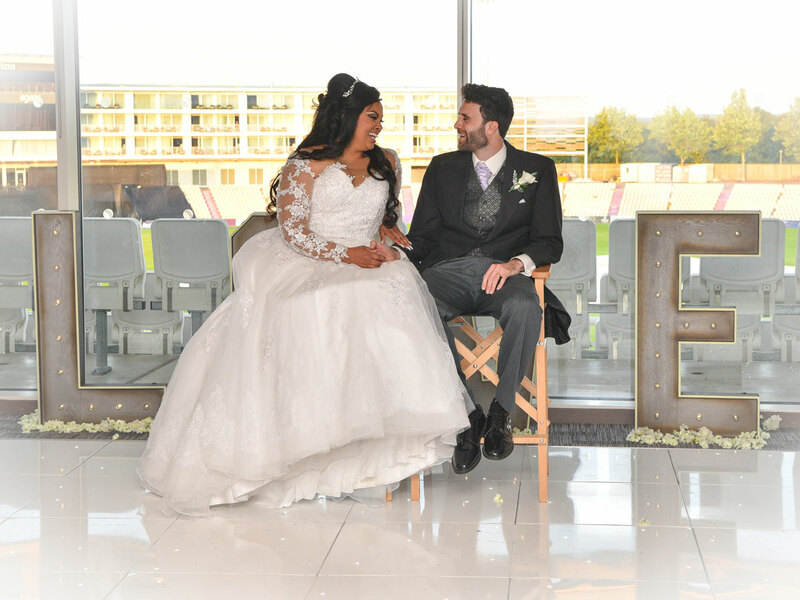 Angela & Mark’s day started with their wedding ceremony in the Derek Shackleton theatre with a backdrop, panoramic view of the Hampshire cricket pitch. 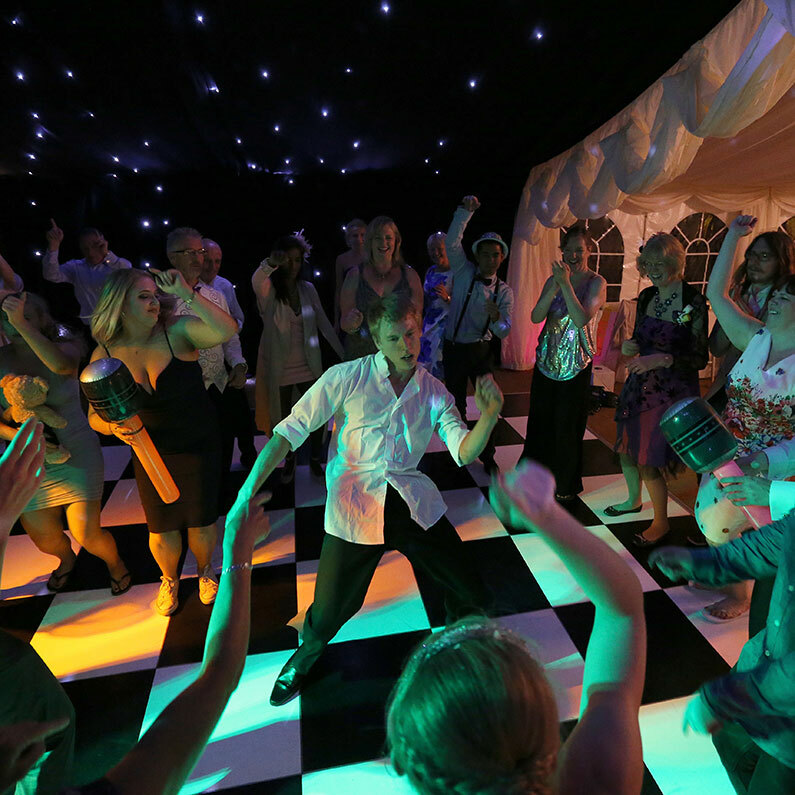 Music and coordination were supplied by us as part of our all day DJ service. 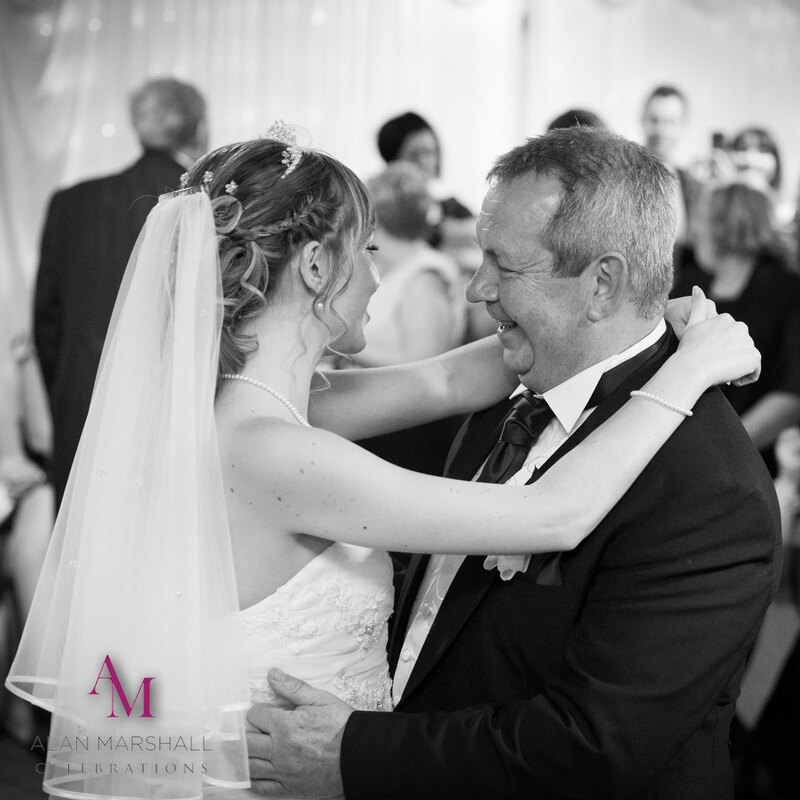 Angela was escorted down the aisle to the Collabro version of A Thousand Years, by her father, Tony, who had flown in from Cape Town, South Africa two days prior to the wedding. We provided background music for the drinks reception, held in the atrium, to keep everyone entertained. Photographer, Paul Bartlett, was on hand to document the day, which included many photos of the guests on the edge of the cricket field. Soon it was time for the wedding breakfast, which was held upstairs in the Robin Smith Suite. We settled everyone and then introduced the entire bridal party into the room with fun bio’s that we had scripted in advance with Angela & Mark. During the meal, we supplied background music and then microphones for the toasts. Each table had to work as a team to complete our popular pearls of wisdom cards and a bridal trivia quiz, which included questions about the happy couple, creating a fun, engaging time for all. By seven thirty in the evening, it was time for the cake cutting ceremony, which was followed by Angela & Mark’s Love Story! – The Love Story, one of our signature pieces, is a way to emotionally involve all of the guests at your evening reception and is often remarked on as being one of the biggest highlights for our couples on their wedding day. “A year after they first met they arrived in South Africa, Mark was a little worried taking the ring to South Africa that customs would want to open his bag while in the queue. After all, he didn’t want to propose in customs & with Angela who still had no idea during the trip, he was going to propose, It needed to be perfect! The love story led straight into their first dance as Husband and wife, “Finally found someone” – Bryan Adams & Barbara Streisand, which then led into a special dance where Tony, Angela’s dad, got a chance to dance with his daughter on her wedding day for the Father Daughter dance to “Dance with my daughter” – Jason Blaine. As the evening continued and the dance floor filled up with guests of every age dancing until their feet hurt, Angela even got a chance to DJ to a pre recorded mix that we had specially put together for her. With their honeymoon destination, there was only choice for the last song of the night – New York, New York by Frank Sinatra. 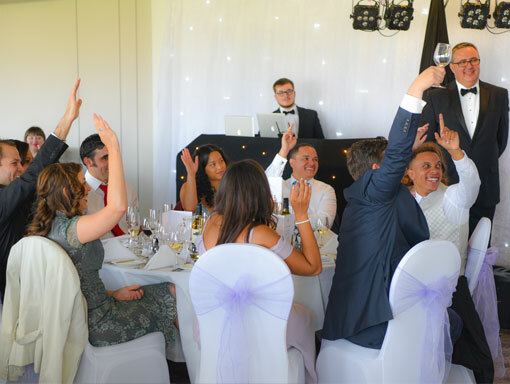 Guests were invited to join Mark & Angela, the new Mr and Mrs Punnett, for one last hurrah, all knowing that they had been part of a very special celebration. 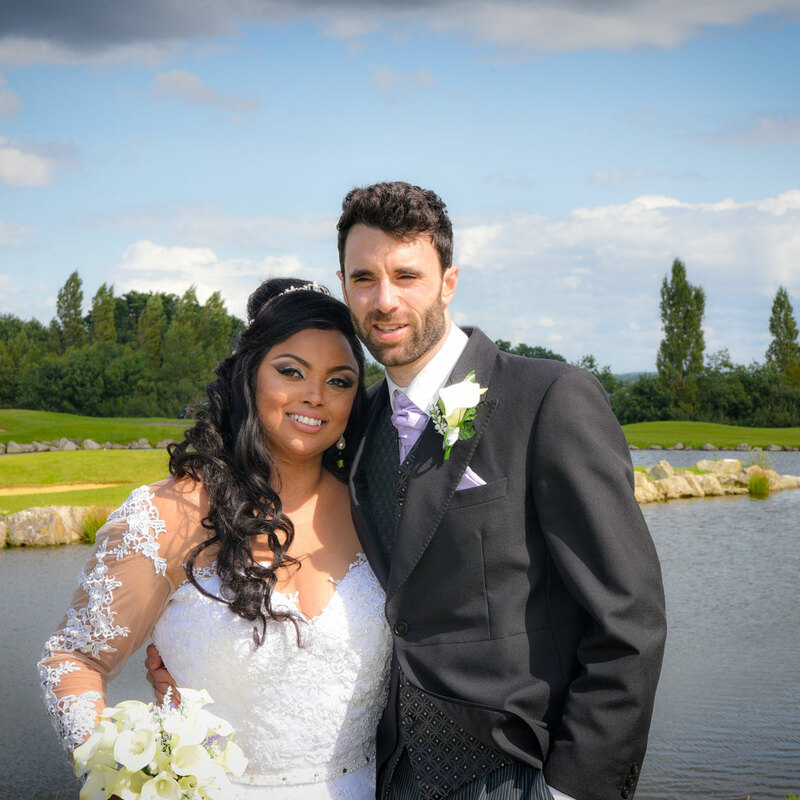 The second wedding was for Vanessa & James on the 19th August. A very early start at the Ageas Bowl to get everything set up, with a plan to have the ceremony outside over looking the pitch. Sadly, for a venue famous for balls being bowled, the weather was not playing ball. Scattered showers and intervals of sunshine, led us to believe it could happen outside but, twenty minutes before the ceremony, it started to rain again! Everybody, from the staff at the venue through to the florist, Photographers, videographers, myself and my assistant, sprung into action to get the chairs into the dry for plan B. When Vanessa arrived, in her stretched white limo with the entire bridal party on board, James was waiting at the top of the aisle and everything was set. The ceremony started as the Mother of the Bride and Vanessa’s Gran & Grandad made their way down the aisle, followed by the bridesmaids, to “Halo” – Beyoncé. 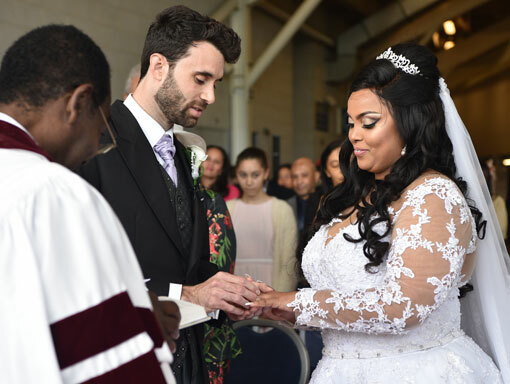 Then the bride, Vanessa was escorted by her father Derek, to “Spend My Life With You” – Tamia & Eric Bennett. During the planning, Vanessa’s main concern was that her guests would be bored being there from midday until one a.m. the following morning, there was lots of time to fill. It was important to her, that there would be lots of activities and engaging moments through out the day. By using my unique process of planning, design and hosting, the guests were always guided and informed of what was happening and how they would be involved them. Vanessa’s mind was put at rest, knowing that she could trust us with her wedding day. 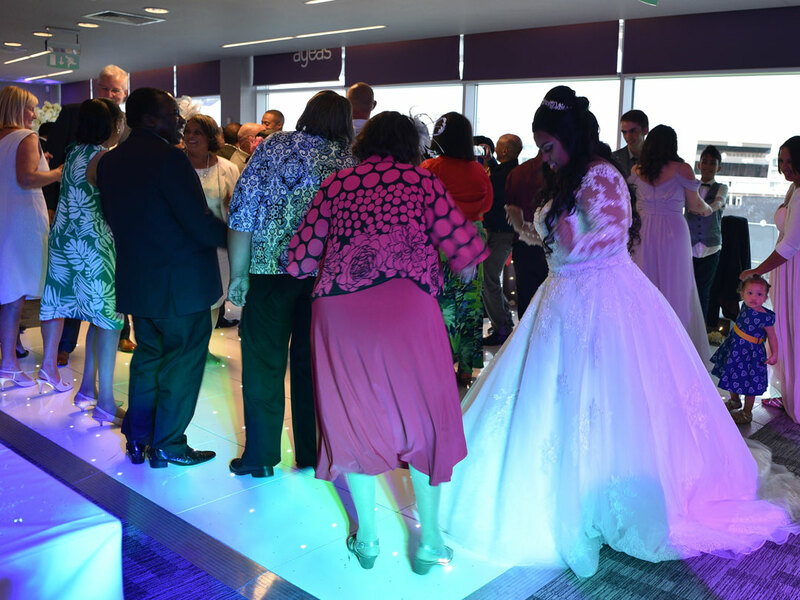 The wedding breakfast was held up stairs in the Ageas Suite, based within the Shane Warne Stand, commencing with introductions for the entire bridal party, prior to introducing the Speeches & Toast, before the food. During dinner, guests were entertained with a bridal trivia quiz, plus pearls of wisdom, culminating in the shoe game, with questions selected by maid of honour, Tanya (Vanessa’s sister). The whole room was filled with laughter and no one felt excluded. 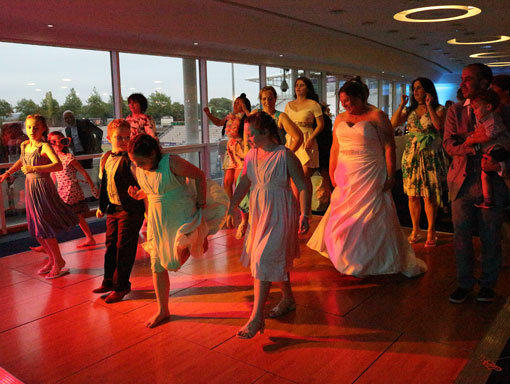 The evening got under way, once additional guests had arrived, with the father daughter dance. I introduced this with a memory that Vanessa had shared with us of dad while she was growing up that connected everyone. This set the scene perfectly for their special dance to “Daddy” – Abby Anderson. James & Vanessa’s Love Story followed this, leading into their first dance, “Stand by me” – Ben E King. Vanessa almost fainted, ……but still had enough breathe in her to ask where’s the ring? James just looked back like a deer caught in the headlights! At which point Vanessa took a ring-pull from the lid of a water bottle, passed it to James and made him propose all over again!! After the first dance James had a special dance with his mum for the Mother Son dance, “Blue Skies” – Rod Stewart. Next the party got going with some special dances that were personal to Vanessa & James, with Vanessa’s family being originally from Bulawaiyo in Zimbabwe, the dance floor filled to songs from artists such as Brenda Fassie, Mafkizolo and Joe Mafela. Later in the evening, with James’ family being from Greece, Zorba’s Dance was a must!!! The night ended with James and Vanessa’s last dance to “Time of my life” – Bill Medley and Jennifer Warnes, an appropriate song to reflect on the new Mr & Mrs Condylis’ special day. 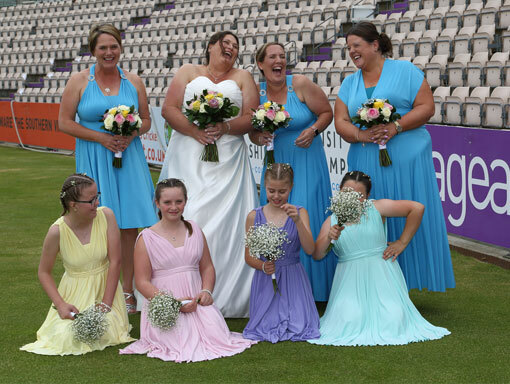 If you’re getting married at The Ageas Bowl, or anywhere else in Hampshire, then please get in touch to arrange an appointment to discuss the fun you and your guests could have at your wedding.